Looking for a modern retreat on the beach? 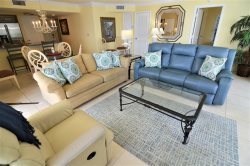 Look no further then this 2 bedroom 2 bathroom beach front condo at Sanibel Harbour Resort that has a private wrap around balcony. As entering you will be welcomed with a contemporary kitchen design leading to a spacious living room. Large wall mounted TV and DVD player offered in the living area along with an ample sized work desk and sleeper sofa. Both the master bedroom and second bedroom have Queen Beds and wall mounted TV’s. Both bathrooms have been completely renovated with a walk in shower and soaking tub in the master bathroom and a walk in shower in the guest bathroom. Tile throughout the unit. Sleeps 6 people. I was looking for the place to dispose of my trash. An employee of the facility saw me looking and not only told me where the garbage shoot was but took my garbage and disposed of it himself. The condo was very nice and well kept. The property was in great shape. Thoroughly enjoyed our stay. Great view. Very relaxing vacation. Property was great only thing that needs improvement is the pool hours should be later. Always very freindly and helpful. Delivered Items were brought to the door. Exceptional attentive. Our condo was beautiful. Very clean and had everything we needed for our stay. Would recommend this place to everyone. Liked the pool and hot tub and location on the beach. Our kids had a great time meeting new people at the pool.